"Deltas" redirects here. For other uses, see Delta (disambiguation). A river delta is a landform that forms from deposition of sediment that is carried by a river as the flow leaves its mouth and enters slower-moving or stagnant water. This occurs where a river enters an ocean, sea, estuary, lake, reservoir, or (more rarely) another river that cannot carry away the supplied sediment. The size and shape of a delta is controlled by the balance between watershed processes that supply sediment, and receiving basin processes that redistribute, sequester, and export that sediment. The size, geometry, and location of the receiving basin also plays an important role in delta evolution. River deltas are important in human civilization, as they are major agricultural production centers and population centers. They can provide coastline defense and can impact drinking water supply. They are also ecologically important, with different species' assemblages depending on their landscape position. River deltas form when a river carrying sediment reaches either (1) a body of water, such as a lake, ocean, or reservoir, (2) another river that cannot remove the sediment quickly enough to stop delta formation, or (3) an inland region where the water spreads out and deposits sediments. The tidal currents also cannot be too strong, as sediment would wash out into the water body faster than the river deposits it. The river must carry enough sediment to layer into deltas over time. The river's velocity decreases rapidly, causing it to deposit the majority, if not all, of its load. This alluvium builds up to form the river delta. When the flow enters the standing water, it is no longer confined to its channel and expands in width. This flow expansion results in a decrease in the flow velocity, which diminishes the ability of the flow to transport sediment. As a result, sediment drops out of the flow and deposits. Over time, this single channel builds a deltaic lobe (such as the bird's-foot of the Mississippi or Ural river deltas), pushing its mouth into the standing water. As the deltaic lobe advances, the gradient of the river channel becomes lower because the river channel is longer but has the same change in elevation (see slope). As the slope of the river channel decreases, it becomes unstable for two reasons. First, gravity makes the water flow in the most direct course down slope. If the river breaches its natural levees (i.e., during a flood), it spills out into a new course with a shorter route to the ocean, thereby obtaining a more stable steeper slope. Second, as its slope gets lower, the amount of shear stress on the bed decreases, which results in deposition of sediment within the channel and a rise in the channel bed relative to the floodplain. This makes it easier for the river to breach its levees and cut a new channel that enters the body of standing water at a steeper slope. Often when the channel does this, some of its flow remains in the abandoned channel. When these channel-switching events occur, a mature delta develops a distributary network. Another way these distributary networks form is from deposition of mouth bars (mid-channel sand and/or gravel bars at the mouth of a river). When this mid-channel bar is deposited at the mouth of a river, the flow is routed around it. This results in additional deposition on the upstream end of the mouth-bar, which splits the river into two distributary channels. A good example of the result of this process is the Wax Lake Delta. Most large river deltas discharge to intra-cratonic basins on the trailing edges of passive margins due to the majority of large rivers such as the Mississippi, Nile, Amazon, Ganges, Indus, and Yangtze discharging along passive continental margins. This phenomenon is due to three big factors: topography, basin area, and basin elevation. Topography along passive margins tend to be more gradual and widespread over a greater area enabling sediment to pile up and accumulate overtime to form large river deltas. Topography along active margins tend to be steeper and less widespread, which results in sediments not having the ability to pile up and accumulate due to the sediment traveling into a steep subduction trench rather than a shallow continental shelf. There are many other smaller factors that could explain why the majority of river deltas form along passive margins rather than active margins. Along active margins, orogenic sequences cause tectonic activity to form over-steepened slopes, brecciated rocks, and volcanic activity resulting in delta formation to exist closer to the sediment source. When sediment does not travel far from the source, sediments that build up are coarser grained and more loosely consolidated, therefore making delta formation more difficult. Tectonic activity on active margins causes the formation of river deltas to form closer to the sediment source which may affect channel avulsion, delta lobe switching, and auto cyclicity. Active margin river deltas tend to be much smaller and less abundant but may transport similar amounts of sediment. However, the sediment is never piled up in thick sequences due to the sediment traveling and depositing in deep subduction trenches. Deltas are typically classified according to the main control on deposition, which is a combination of river, wave, and tidal processes, depending on the strength of each. The other two factors that play a major role are landscape position and the grain size distribution of the source sediment entering the delta from the river. In wave dominated deltas, wave-driven sediment transport controls the shape of the delta, and much of the sediment emanating from the river mouth is deflected along the coast line. The relationship between waves and river deltas is quite variable and largely influenced by the deepwater wave regimes of the receiving basin. With a high wave energy near shore and a steeper slope offshore, waves will make river deltas smoother. Waves can also be responsible for carrying sediments away from the river delta, causing the delta to retreat. For deltas that form further upriver in an estuary, there are complex yet quantifiable linkages between winds, tides, river discharge, and delta water levels. 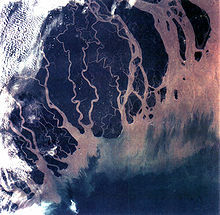 Erosion is also an important control in tide-dominated deltas, such as the Ganges Delta, which may be mainly submarine, with prominent sandbars and ridges. This tends to produce a "dendritic" structure. Tidal deltas behave differently from a river- and wave-dominated deltas, which tend to have a few main distributaries. Once a wave- or river-dominated distributary silts up, it is abandoned, and a new channel forms elsewhere. In a tidal delta, new distributaries are formed during times when there is a lot of water around – such as floods or storm surges. These distributaries slowly silt up at a more or less constant rate until they fizzle out. A Gilbert delta (named after Grove Karl Gilbert) is a type of delta formed from coarse sediments, as opposed to gently-sloping muddy deltas such as that of the Mississippi. 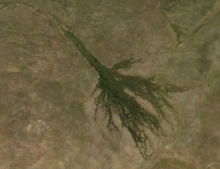 For example, a mountain river depositing sediment into a freshwater lake would form this kind of delta. While some authors describe both lacustrine and marine locations of Gilbert deltas, others note that their formation is more characteristic of the freshwater lakes, where it is easier for the river water to mix with the lakewater faster (as opposed to the case of a river falling into the sea or a salt lake, where less dense fresh water brought by the river stays on top longer). Gilbert himself first described this type of delta on Lake Bonneville in 1885. Elsewhere, similar structures occur, for example, at the mouths of several creeks that flow into Okanagan Lake in British Columbia and forming prominent peninsulas at Naramata, Summerland, and Peachland. A tidal freshwater delta is a sedimentary deposit formed at the boundary between an upland stream and an estuary, in the region known as the "subestuary". Drowned coastal river valleys that were inundated by rising sea levels during the late Pleistocene and subsequent Holocene tend to have dendritic estuaries with many feeder tributaries. Each tributary mimics this salinity gradient from their brackish junction with the mainstem estuary up to the fresh stream feeding the head of tidal propagation. As a result, the tributaries are considered to be "subestuaries". The origin and evolution of a tidal freshwater delta involves processes that are typical of all deltas as well as processes that are unique to the tidal freshwater setting. The combination of processes that create a tidal freshwater delta result in a distinct morphology and unique environmental characteristics. Many tidal freshwater deltas that exist today are directly caused by the onset of or changes in historical land use, especially deforestation, intensive agriculture, and urbanization. These ideas are well illustrated by the many tidal freshwater deltas prograding into Chesapeake Bay along the east coastline of the United States. 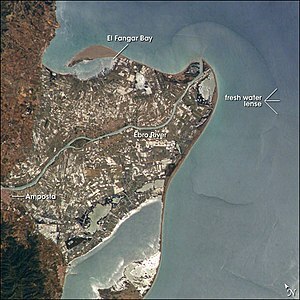 Research has demonstrated that the accumulating sediments in this estuary derive from post-European settlement deforestation, agriculture, and urban development. Other rivers, particularly those on coasts with significant tidal range, do not form a delta but enter into the sea in the form of an estuary. Notable examples include the Gulf of Saint Lawrence and the Tagus estuary. In rare cases the river delta is located inside a large valley and is called an inverted river delta. Sometimes a river divides into multiple branches in an inland area, only to rejoin and continue to the sea. Such an area is called an inland delta, and often occurs on former lake beds. The Inner Niger Delta and Peace–Athabasca Delta are notable examples. The Amazon also has an inland delta before the island of Marajó, and the Danube has one in the valley on the Slovak-Hungarian border between Bratislava and Iža. In some cases, a river flowing into a flat arid area splits into channels that evaporate as it progresses into the desert. The Okavango Delta in Botswana is one example. The generic term mega delta can be used to describe very large Asian river deltas, such as the Yangtze, Pearl, Red, Mekong, Irrawaddy, Ganges-Brahmaputra, and Indus. The Ganges-Brahmaputra Delta, which spans most of Bangladesh and West Bengal, India empties into the Bay of Bengal, is the world's largest delta. The St. Clair River delta, between the Canadian province of Ontario and the U.S. state of Michigan, is the largest delta emptying into a body of fresh water. Human activities, such as the creation of dams for hydroelectric power or to create reservoirs can radically alter delta ecosystems. Dams block sedimentation, which can cause the delta to erode away. The use of water upstream can greatly increase salinity levels as less fresh water flows to meet the salty ocean water. While nearly all deltas have been impacted to some degree by humans, the Nile Delta and Colorado River Delta are some of the most extreme examples of the ecological devastation caused to deltas by damming and diversion of water. Construction, irrigation, and land alteration have impacted delta formation. As humans have altered surface roughness, runoff, and groundwater storage, studies have shown river delta retreat. However, historical data documents show that during the Roman Empire and Little Ice Age (times where there was considerable anthropogenic pressure), there were significant sediment accumulation in deltas. The industrial revolution has only amplified the impact of humans on delta growth and retreat. Ancient deltas are a benefit to the economy due to their well sorted sand and gravel. Sand and gravel is often quarried from these old deltas and used in concrete for highways, buildings, sidewalks, and even landscaping. More than 1 billion tons of sand and gravel are produced in the United States alone. Not all sand and gravel quarries are former deltas, but for ones that are, much of the sorting is already done by the power of water. Probable delta in Eberswalde crater, as seen by Mars Global Surveyor. Image in Margaritifer Sinus quadrangle. ^ Blum, M.D. ; Tornqvist, T.E. (2000). "Fluvial responses to climate and sea-level change: a review and look forward". Sedimentology. 47: 2–48. doi:10.1046/j.1365-3091.2000.00008.x. ^ a b Pasternack, Gregory B.; Brush, Grace S.; Hilgartner, William B. (2001-04-01). "Impact of historic land-use change on sediment delivery to a Chesapeake Bay subestuarine delta". Earth Surface Processes and Landforms. 26 (4): 409–427. doi:10.1002/esp.189. ISSN 1096-9837. ^ a b Anthony, Edward J. (2015-03-01). "Wave influence in the construction, shaping and destruction of river deltas: A review". Marine Geology. 361: 53–78. doi:10.1016/j.margeo.2014.12.004. ^ "How a Delta Forms Where River Meets Lake". 2014-08-12. Retrieved 2017-12-12. ^ "Dr. Gregory B. Pasternack – Watershed Hydrology, Geomorphology, and Ecohydraulics :: TFD Modeling". pasternack.ucdavis.edu. Retrieved 2017-06-12. ^ a b c d e Milliman, J. D.; Syvitski, J. P. M. (1992). "Geomorphic/Tectonic Control of Sediment Discharge to the Ocean: The Importance of Small Mountainous Rivers". The Journal of Geology. 100 (5): 525–544. doi:10.1086/629606. JSTOR 30068527. ^ a b Goodbred, S. L.; Kuehl, S. A. (2000). "The significance of large sediment supply, active tectonism, and eustasy on margin sequence development: Late Quaternary stratigraphy and evolution of the Ganges-Brahmaputra delta". Sedimentary Geology. 133 (3–4): 227–248. doi:10.1016/S0037-0738(00)00041-5. ^ a b Galloway, W.E., 1975, Process framework for describing the morphologic and stratigraphic evolution of deltaic depositional systems, in Brousard, M.L., ed., Deltas, Models for Exploration: Houston Geological Society, Houston, Texas, pp. 87–98. ^ Orton, G.J. ; Reading, H.G. (1993). "Variability of deltaic processes in terms of sediment supply, with particular emphasis on grain size". Sedimentology. 40 (3): 475–512. doi:10.1111/j.1365-3091.1993.tb01347.x. ^ "Dr. Gregory B. Pasternack – Watershed Hydrology, Geomorphology, and Ecohydraulics :: TFD Hydrometeorology". pasternack.ucdavis.edu. Retrieved 2017-06-12. ^ Pasternack, Gregory B.; Hinnov, Linda A. (October 2003). "Hydrometeorological controls on water level in a vegetated Chesapeake Bay tidal freshwater delta". Estuarine, Coastal and Shelf Science. 58 (2): 367–387. doi:10.1016/s0272-7714(03)00106-9. ^ Bernard Biju-Duval, J. Edwin Swezey. "Sedimentary Geology". Page 183. ISBN 2-7108-0802-1. Editions TECHNIP, 2002. Partial text on Google Books. ^ a b "Geological and Petrophysical Characterization of the Ferron Sandstone for 3-D Simulation of a Fluvial-deltaic Reservoir". By Thomas C. Chidsey, Thomas C. Chidsey, Jr (ed), Utah Geological Survey, 2002. ISBN 1-55791-668-3. Pages 2–17. Partial text on Google Books. ^ "Dr. Gregory B. Pasternack – Watershed Hydrology, Geomorphology, and Ecohydraulics :: Tidal Freshwater Deltas". pasternack.ucdavis.edu. Retrieved 2017-06-12. ^ Pasternack, G. B. 1998. Physical dynamics of tidal freshwater delta evolution. Ph.D. Dissertation. The Johns Hopkins University, 227pp, 5 appendices. ^ Pasternack, Gregory B.; Hilgartner, William B.; Brush, Grace S. (2000-09-01). "Biogeomorphology of an upper Chesapeake Bay river-mouth tidal freshwater marsh". Wetlands. 20 (3): 520–537. doi:10.1672/0277-5212(2000)020<0520:boaucb>2.0.co;2. ISSN 0277-5212. ^ Pasternack, Gregory B; Brush, Grace S (2002-03-01). "Biogeomorphic controls on sedimentation and substrate on a vegetated tidal freshwater delta in upper Chesapeake Bay". Geomorphology. 43 (3–4): 293–311. doi:10.1016/s0169-555x(01)00139-8. ^ Pasternack, Gregory B.; Brush, Grace S. (1998-09-01). "Sedimentation cycles in a river-mouth tidal freshwater marsh". Estuaries. 21 (3): 407–415. doi:10.2307/1352839. ISSN 0160-8347. JSTOR 1352839. ^ Gottschalk, L. C. (1945). "Effects of soil erosion on navigation in upper Chesapeake Bay". Geographical Review. 35 (2): 219–238. doi:10.2307/211476. JSTOR 211476. ^ Brush, G. S. (1984). "Patterns of recent sediment accumulation in Chesapeake Bay (Virginia-Maryland, U.S.A.) tributaries". Chemical Geology. 44 (1–3): 227–242. doi:10.1016/0009-2541(84)90074-3. ^ Orson, R. A.; Simpson, R. L.; Good, R. E. (1992). "The paleoecological development of a late Holocene, tidal freshwater marsh of the upper Delaware River estuary". Estuaries. 15 (2): 130–146. doi:10.2307/1352687. JSTOR 1352687. ^ Maselli, Vittorio; Trincardi, Fabio (2013-05-31). "Man made deltas". Scientific Reports. 3: 1926. doi:10.1038/srep01926. ISSN 2045-2322. PMC 3668317. PMID 23722597. ^ "Mineral Photos – Sand and Gravel". Mineral Information Institute. 2011. Archived from the original on 2011-10-06. Retrieved 2011-11-02. Ottinger, M.; Kuenzer, C.; LIU; Wang, S.; Dech, S. (2013). "Monitoring Land Cover Dynamics in the Yellow River Delta from 1995 to 2010 based on Landsat 5 TM". Applied Geography. 44: 53–68. doi:10.1016/j.apgeog.2013.07.003. Wikimedia Commons has media related to River deltas.